We welcome you and/or your daughter to spend a week with us this summer at Arequipa Day Camp. We are planning a full week of great activities to share with the girls. Log in and review your account for any balance due. You can pay by PayPal or check, but payment must be received within TWO WEEKS of acceptance or your child will be dropped from camp. – Financial aid forms are due to Council by June 1. – All other forms are due to Day Camp no later than April 24. If you are on the waitlist, get the forms in ahead of time, to assure your immediate acceptance if a space becomes available. *If we do not receive these two forms by April 24 we will drop your daughter from camp and place her at the bottom of the wait list for her session of camp and replace her with another girl from the wait list. Please do not miss this deadline. ∗ IF YOUR CHILD IS UNABLE TO ATTEND CAMP: Please email us as soon as possible – and no later than 72 hours prior to camp – in order for other girls on our waiting list to be admitted. ∗ ATTENDANCE AND CAMP PHONE NUMBER: If your child becomes ill and will not be attending camp for the day, please call and leave a message before 9:30am at the camp phone number 457-5990. This number is to report absences and for emergencies ONLY. Girls will be assigned to camp units and will remain in that unit the entire week. There are usually two adults and two girl aides assigned to each unit as well. At camp we encourage girls to meet and make new friends. Your will receive an email approximately two weeks prior to camp indicating which unit your daughter will be assigned to, who her Unit Leaders are, and her bus stop assignment and location (including time of pick up and drop off). Each bus will have an adult bus rider on board. S/he will be responsible for checking girls on and off of the bus each day. S/he is also responsible for the safety of everyone on the bus. If your child is disruptive on the bus, you may be required to provide your own transportation to and from camp. SOCKS and durable SHOES such as sneakers or hiking boots with shoelaces are necessary for camp. NO sandals, slip-ons, clogs, jellies or heels. NO “short-shorts” or halter tops or Girl Scout uniforms. CAMP T-SHIRTS will be distributed on the first day, and they are to be worn each day for identification purposes (expect to wash the t-shirt frequently or order extra shirts). SHORTS are allowed with long socks. LONG PANTS are recommended to protect campers from deer ticks and scratches on hikes. Pack a SWEATSHIRT and LONG PANTS as temperatures can change quickly. The girls do get dirty, so, no new clothes and please label everything. This dress code is for the health and safety of the campers. Each day: Each camper needs to bring a healthy LUNCH and a DRINK; a WATER BOTTLE (recyclable! ); BANDANA or HAT; BACKPACK to carry all of her things; see CLOTHING recommendations above; SWIMSUIT, TOWEL, and large closeable PLASTIC BAG for wet things. Cookout day: Each unit will do a cookout once during the week and a notice will be sent home the night before. On that day please have your child bring a MESS KIT, non-breakable CUP & UTENSILS. Do NOT bring: Please NO radios, iPods, electronics devices, expensive items, candy, gum or sugary snacks. 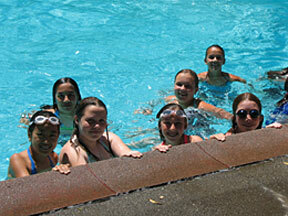 Campers should apply sunscreen before coming to camp each day and bring more with them for before and after swimming. A hat is also recommended. If for any reason your child needs leave during the day, as for a doctor's appointment, you must send a note the previous day detailing the time you child will be leaving, who will be picking your child up, the license number and make of their vehicle. Your child must be signed out with the camp nurse. If your child returns to camp it must be before 2:30 PM so as not to interfere with the bus traffic. You will need to sign your child back in with the camp nurse. If at all possible do not schedule appointments during camp hours, as we don’t want your child to miss out on camp program. If your camper has special needs, please let us know immediately so that we can make appropriate accommodations. If there are any food allergies that we need to know about please let us know as soon as possible and on the Health History form. Many parents are working parents who rely on summer camps, such as ours, during the summer to care for their children. We understand that you may be able to write off summer camp fees as child care expenses and require our tax ID number for that: #94-1551410. Arequipa Day Camp, which has been in existence for 49 years, provides this camp experience to over 450 girls thanks to the generosity of our adult volunteers. These volunteers have taken six or more hours of training in addition to working the five days of camp. Our volunteers are very tired at the end of each day. Perhaps there is a kindness you can extend such as a thank you note from your camper, gift certificate for a massage or a manicure, car wash certificate, gift certificate for a pizza and a movie, or some other thank you gift at week’s end. This would be a wonderful way to show your appreciation to these wonderful people who are giving so much of their time and talents for your child’s enrichment and enable us to provide a great camp at a low cost to you. We look forward to meeting each of your children on the first day of camp!